Downscaling of water withdrawals from regional/national to local scale is a fundamental step and also a common problem when integrating large scale economic and integrated assessment models with high-resolution detailed sectoral models. Tethys, an open-access software written in Python, is developed with statistical downscaling algorithms, to spatially and temporally downscale water withdrawal data to a finer scale. The spatial resolution will be downscaled from region/basin scale to grid (0.5 geographic degree) scale and the temporal resolution will be downscaled from year to month. Tethys is used to produce monthly global gridded water withdrawal products based on estimates from the Global Change Assessment Model (GCAM). Tethys was constructed at the Joint Global Change Research Institute of the Pacific Northwest National Laboratory (http://www.globalchange.umd.edu). It served as a critical step to link Xanthos (a global hydrologic model)  and the Global Change Assessment Model (GCAM) [2, 3]. The spatial resolution of GCAM is geopolitical regional scale for energy and economy systems (e.g. 32 regions), and river basins for the land, agriculture, and water systems (e.g. 235 water basins ). GCAM is often used as a boundary condition and coupled to sectoral models, such as the Community Land Model and Xanthos, which typically operate at finer spatial and temporal scales than GCAM [19, 20]. For example, Xanthos is a globally gridded hydrology model that operates at monthly scale. Resolving such a mismatch in spatial and temporal scales facilitated coupling these models together. It is also helpful for understanding seasonal patterns of water use and acquiring high resolution water use data . The main objective of Tethys is to reconstruct global monthly gridded (0.5 geographic degree) water withdrawal datasets by spatial and temporal downscaling water withdrawal estimates at region/basin and annual scale (Figure 1). As an open-access software, Tethys applies statistical downscaling algorithms, to spatially and temporally downscale water withdrawal data from annual region/basin scale into monthly grid scale. In our study, the water withdrawals are separated into six sectors: irrigation, livestock, domestic, electricity (generation), manufacturing and mining. Major inputs and outputs of Tethys by six sectors. The algorithms for spatial downscaling were derived from research by Edmonds and Reilly [2, 4]. Non-agriculture (domestic, electricity, manufacturing and mining) sectors are downscaled based on global gridded population density maps . Irrigation water withdrawal is downscaled using global coverage of gridded cropland areas equipped with irrigation [7, 8]. The gridded population maps (combined Historical Database of the Global Environment (HYDE)  and Gridded Population of the World (GPW)  data products) and gridded crop irrigation area maps (combined HYDE  and Food and Agriculture Organization (FAO)  data products) are updated in the algorithms over time by using historical datasets (the most recent available historical map is applied for future years). The gridded global maps of livestock in six types (cattle, buffalo, sheep, goats, pigs and poultry)  are used as proxy to downscale livestock water withdrawal [6, 13, 14]. Irrigation: The monthly gridded irrigation water withdrawal was estimated by relying on monthly irrigation results from several global hydrological models (e.g. H08 [15, 16], LPJmL , and PCR-GLOBWB [6, 18]) to quantify monthly weighting profiles of how irrigation is spread out within a year in a particular region and per crop type. Domestic: Temporal downscaling of domestic water withdrawal from annual to monthly was based on a formula from  and  and utilizing monthly temperature data; details of data sources were listed in . Electricity: Temporal downscaling of electricity water withdrawal from annual to monthly was based on the assumption that the amount of water withdrawal for electricity generation is proportional to the amount of electricity generated [19, 20]. Livestock, manufacturing and mining: A uniform distribution was applied; i.e., the same water withdrawal amount was applied to each month within a year. An example of data products from temporal downscaling was illustrated in Figure 2. Monthly profiles were estimated from annual water withdrawal estimates of USA in 2010 for domestic, electricity generation and irrigation sectors. Downscaled sectoral (domestic, electricity generation and irrigation) monthly distributions of water withdrawals in USA from annual estimates in 2010. Tethys is written in Python (version 2.7) with scientific libraries. Besides the modules, it also provides collected and consolidated data from various sources as inputs. Each of the datasets used by Tethys has clear sources and references that will be beneficial for the users to update and create their own datasets. For each step, the corresponding module package is also listed. Spatial downscaling (Step 2) is the core of computation flow in Tethys while temporal downscaling (Step 3) is an additional step. 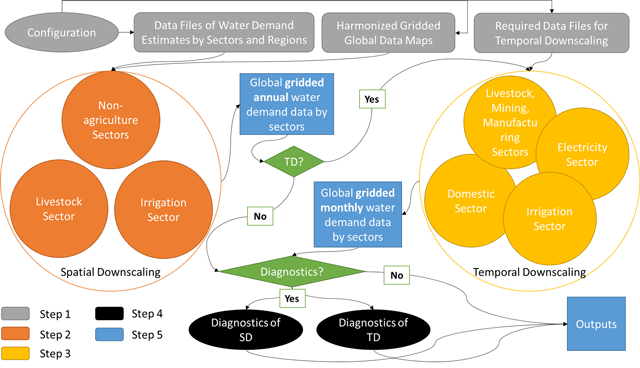 The outputs of Step 2, global gridded annual water withdrawal data by sectors, are the inputs of Step 3. The term “grid” is used to describe the spatial resolution of 0.5 geographic degrees. A global full data map contains a total of 259,200 grid cells (360 × 720) of which 67,420 grid cells are categorized as “land grids” and are considered valid for simulation purposes. In this study, the land grid cells are used to define a “gridded” map according to the coordinates and the indexes of the 67,420 cells on the 360 × 720 grid. To aggregate the gridded data into basin/country/region scale for outputs and diagnostics, certain commonly used global data maps such as IDs of basins/countries/regions are harmonized into the gridded format required by Tethys. The inputs converted using the 67,420 grid cells according to the coordinate data file are called harmonized inputs. Project (Required): This section defines the paths of input and output folders, the output formatting, along with two important options 1) “PerformDiagnostics” determines if diagnostics will be performed; 2) “PerformTemporal” determines if temporal downscaling will be performed. GCAM (Required): As described previously, two formats are allowed 1) GCAM database format; 2) GCAM csv format. The related parameters need to be defined when switching between options for “UseGCAMDatabase”. GriddedMap (Required): This section defines the required global data maps, such as population, irrigation area, and livestock counts for each grid. TemporaDownscaling (Optional, required only if “PerformTemproal = 1” in “Project” section): All the required data files for temporal downscaling are defined in this section. The time period of the data files should be uniformed (e.g. 1971–2010). When “TemporalInterpolation = 1”, Tethys will linearly interpolate the downscaling results when the input data sets are not annual. The example data files for inputs are all included in the “example\Input” folder while they are divided by subfolders according to the sections described above. The metadata (data source, format, related pre-processing, etc.) of all the input files are described in a document called “ReadMe_IO_Data.pdf”, which is included in the document folder “docs”. As described previously, data files of water withdrawal by sectors and region are imported in Tethys, representing the datasets to be downscaled. Since Tethys was originally designed to link to GCAM, a GCAM reader was developed to query information from GCAM database (BaseX format). To extend the usability of Tethys to the wider community, a series of csv files can be prepared following the GCAM csv format as inputs (Table 1). The user is required to provide formatted data files for each sector. The format for each file and how to prepare them are introduced in “ReadMe_IO_Data.pdf”. Input file names and their corresponding sectors. The results after the spatial downscaling step (Figure 3), i.e., global annual gridded water withdrawal by sectors, are the default outputs of Tethys. Temporal downscaling is optional and if temporal downscaling step is selected, the results of global monthly gridded water withdrawals by sectors will be additionally outputted (Table 2). The outputs can be formatted as classic NetCDF  file. The alternative output format is CSV (comma-separated values). The default option generates results in both formats. The default unit is billion m3 and another optional unit is mm. Tables and plots from the diagnostics step will also be stored in the output folder if the diagnostics option is selected. Output file names and their corresponding sectors. Tethys is a software controlled by inputs. As described in the introduction, these population/livestock/irrigation area data sets used as proxies to spatially downscale different sectors were adopted from widely used open-source databases, which directly determine the quality of the downscaled results. These population/livestock/irrigation area data sets are widely used and high-quality. The users are encouraged to replace the current input data sets and apply preferred data sets. The differences were insignificant indicating that water withdrawals at large scale (e.g. region/basin) are simulated at local scale (e.g. grid). A full table of comparison (“Diagnostics_Spatial_Downscaling.csv”) can be found in the output folder, which will help the user to examine the downscaling results by year, region and sector in case large differences are observed. The comparison details for irrigation can be found in a csv file in the output folder (“Diagnostics_Temporal_Downscaling_Irrigation.csv”). Two figures adopted from  are plotted to monitor domestic and electricity generation sectors, since the downscale algorithms are not based on proxies or uniform distribution The simulated mean monthly domestic water withdrawals were displayed in Figure 4, with reasonable agreement with collected observations in some listed urban centres and countries . Figure 5 shows the comparison between simulated and observed monthly water withdrawals for electricity generation during 2000–2012 in 9 OECD countries. It is found that the simulations agree well with observations in most of the countries. Perfect matches in Figures 4 and 5 are not expected considering the inherent uncertainties  in estimating monthly profiles of water withdrawals. 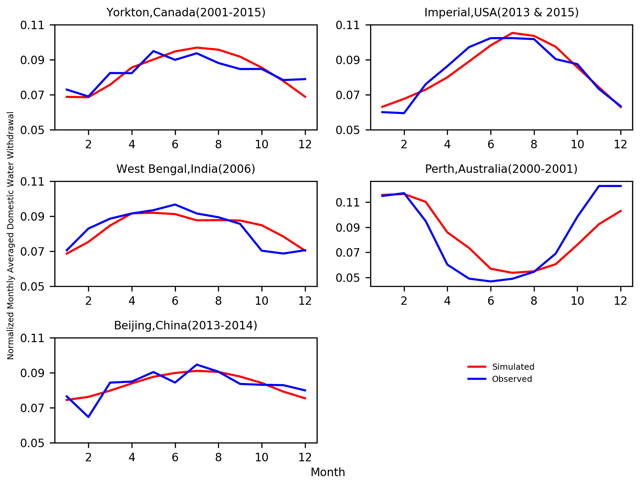 Example of diagnostics plot for comparison between observed and simulated monthly averaged domestic water withdrawal (normalized) in five cities. 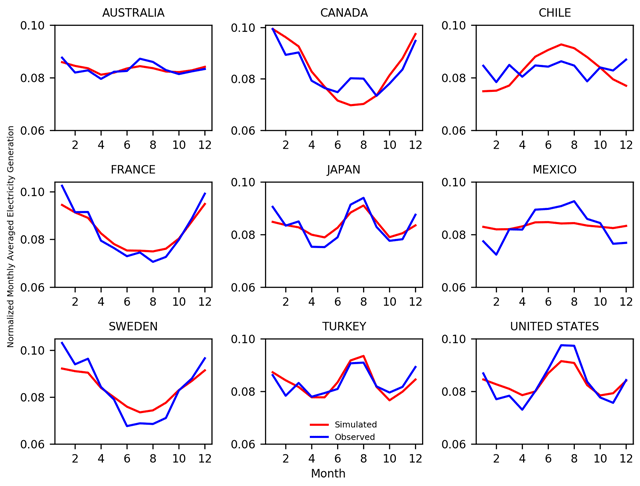 Example of diagnostics plot for comparison between observed and simulated monthly averaged electricity generation (normalized) in nine countries. warnings and errors if applicable. Tethys has been tested successfully on Linux (64-bit), Windows 7 and Mac OS X. As modules using enormous global gridded datasets, a minimum memory size of 8GB is recommended and memory capacity determines how fast the code is able to run. The “InstallationRequirements” file in “docs” on the repository is to help the user set up the Python environment for a proper run. It explains the steps required for a user to download and install the software with all its dependencies. Also, “setup.py” file is included in the repository. The Python language and the dependent library packages used are all open-source. Tethys is highly modularized and designed for easy installation. The modules can be used independently by the user, which also allows the future development and feasibility of user contribution with least effort. Modification of a certain step could be restricted to the corresponding module. Extension of the model is achievable by adding a new module to an existing sub-folder or a new sub-folder. # Read simulator settings from ini file. The reusabilities of Demter-W were also determined by the availability of input data sets. A comman desire is a different spatial resolution. Althrough, the default spatial resolution is 0.5-degree. Tethys can be adjusted to downscale to a different spatial resolution rather than 0.5-degree by updating inputs. The constraint of spatial resolution comes from the input data files not from the algorithm. In “Input” folder, there is a file named “coordinates.csv”. This file listed the 67420 grid cells and their corresponding indexes on the global map (360 × 720) of 0.5 geographic degrees. Tethys reads in this file and stores the grid information (67420 cells) as the “base” map. All the other required gridded maps as inputs should be converted according to this “base” map before being used by Tethys (e.g. All the data files in “harmonized_inputs”). Thus, if another resolution is desired (e.g. 0.25 degree). The user needs to obtain or pre-process all the related input data files in that spatial resolution. For example, if 0.25 degree is desired. The global map size will be 720 × 1440 and 269680 land cells may be considered in the “coordinates.csv”. The required input data files for temporal downscaling. For example, the multiple electricity inputs are required by the downscaling model we used in Tethys (described in ). Thus, the user needs follow the data formats as described in configuration file to run temporal downscaling part. As described previously, a series of formatted csv files (annual regional/basin data to be downscaled) are required and should be provided by the usder. Gridded livestock data maps are divided into six catogories in “example\Input\harmonized_inputs”. These categories might be not applicable for other studies. Although Tethys was used intensively with GCAM data sets, it can still be used with other non-GCAM data sets at region/country/basin scale after reformatting of the input data sets and updating of the gridded data maps. For example, Tethys was applied to an non-global domain (e.g. US states data set was downscaled in ). The input csv files in the scale of US states ranther than regions were generated and the corresponding region maps were replaced by USGS maps (Cells are not US states were excluded by assigning zeros). Again, Tethys is constrained and drived by input data files. It is essential for the users to get familiar with the formats of all the needed data files described in “tethys/docs/ReadMe_IO_Data.pdf”. So they are able to prepare their own data sets to execute Tethys if desired. The installation requirements can be referred in the pdf file “InstallationRequirements.pdf” in the “docs” folder on the repository. Inside the “docs” folder, an introduction file (“ReadMe_IO_Data.pdf”) is included helping the user to get familiar with the data source and format of each input data file. Tethys is founded as a member of an integrated modelling software for global water withdrawal, supply, and scarcity, which the authors’ team is continuing to develop. To make Tethys more general and more resuable is the major goal by increasing the flexibility in the modules to deal with different data limitations. A post-processing module package is under development that is able to plot gridded data on global maps by requirements, which can be linked directly to Tethys and other softwares to provide visualized gridded data results to users. And also the team is collecting available open-source water demand data from other studies in fine scale for certain domains (global data may not be achievable, reported historical estimates of sectoral water withdrawals are often sparse and incomplete) to provide comparison references for historical estimates and future predictions. This research was supported by the Office of Science of the U.S. Department of Energy through the Integrated Assessment Research Program. Edmonds, J and Reilly, J M 1985 Global Energy: Assessing the Future, 317. Oxford University Press, New York. Siebert, S, Döll, P, Feick, S, Hoogeveen, J and Frenken, K 2007 Global map of irrigation areas version 4.0.1. Johann Wolfgang Goethe University, Frankfurt am Main, Germany/Food and Agriculture Organization of the United Nations, Rome, Italy. Portmann, F T, Siebert, S, Bauer, C and Döll, P 2008 Global dataset of monthly growing areas of 26 irrigated crops: Version 1.0. University of Frankfurt, Germany. Siebert, S, Henrich, V, Frenken, K and Burke, J 2013 Global Map of Irrigation Areas version 5. Rheinische Friedrich-Wilhelms-University, Bonn, Germany/Food and Agriculture Organization of the United Nations, Rome, Italy. Wint, W and Robinson, T 2007 Gridded livestock of the world. Food and Agriculture Organization (FAO), report 131. Rome. Flörke, M and Alcamo, J 2004 European outlook on water use. Center for Environmental Systems Research, University of Kassel, Final Report. EEA/RNC/03/007, 83. An Introduction to NetCDF http://www.unidata.ucar.edu/software/netcdf/docs/netcdf_introduction.html.